Some of the most popular items that everyone wants are Christmas-themed little somethings. At our Stampin' Up! demonstrator Christmas party, we exchange stocking stuffer little somethings. We started the tradition just for the fun of sharing. It's always been a fun way to get great ideas for teacher or Secret Santa gifts. Here are some of the gifts that we exchanged last week. 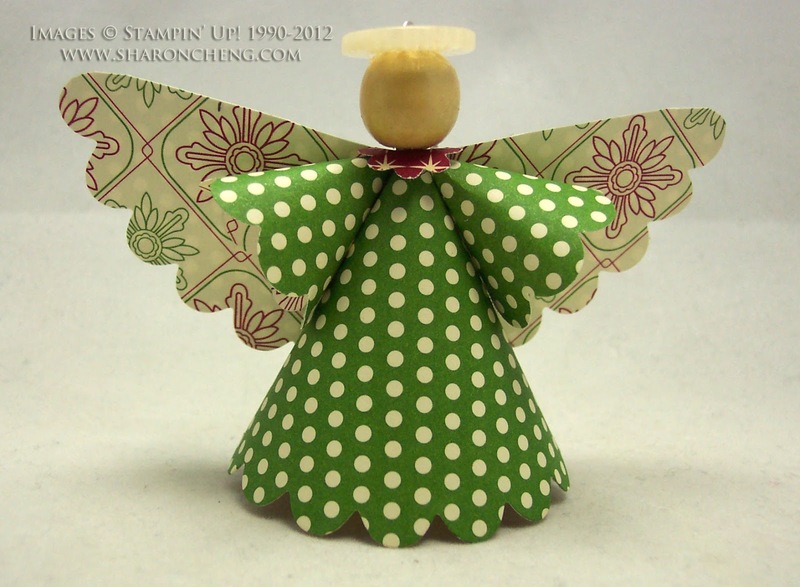 This little Christmas angel was made using the scallop circle die (113468 $19.95), 2 3/8" scallop circle punch (118874 $16.95) and Be of Good Cheer designer series paper (126896 $10.95). The die cut scallop circle cut in half makes the dress and the wings. The smaller scallop circle cut in half makes the sleeves. We also made this Christmas angel in my stamp club. 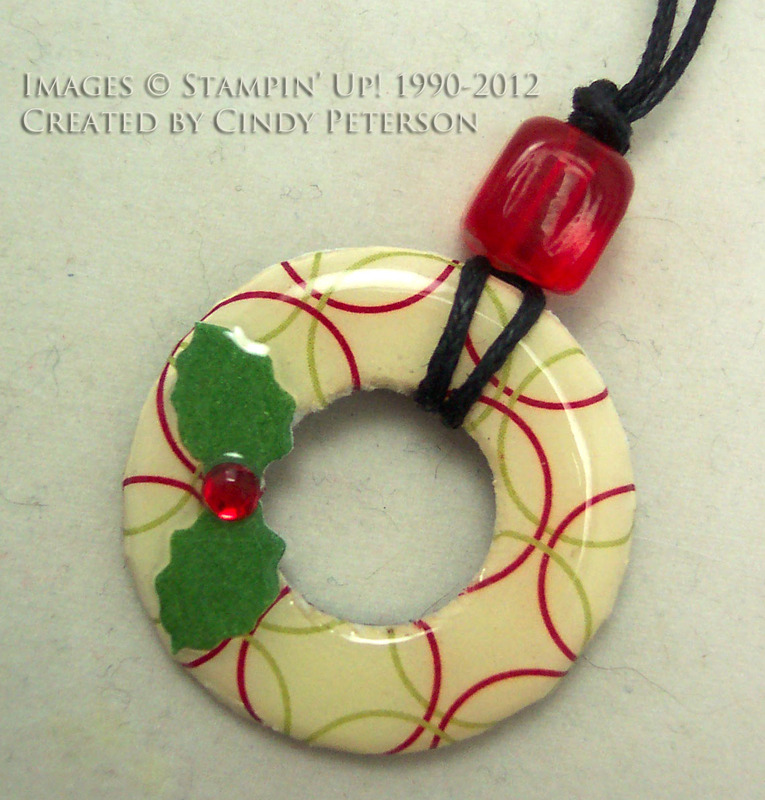 I cased this project and adapted it so that it can be used as shown here or hang as an ornament on your Christmas tree. Cindy Peterson made this necklace out of a metal washer. She covered it with paper from the Be of Good Cheer designer series paper (126896 $10.95) and sealed it with crystal effects. There was a time when gifts were not given Christmas. Early church leaders even tried to outlaw the custom. There are many stories about how the tradition of gift giving at Christmas started. Most of them agree that gift giving was a way to show your friendship and kindness. And that is one of the many reasons why I enjoy making little somethings. It's more about the value of someone's friendship than the actual value of the gift. If you have been following my blog for awhile, then you know that I'm blessed to have such creative and talented friends. It's such a treat to see the projects that these women bring to share with the rest of our group. 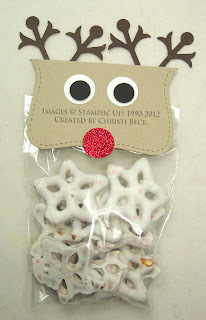 I'll be posting more of the stocking stuffer gifts from our demonstrator Christmas party later.